The children’s author’s latest work deals with a subject barely touched on in other children’s books: autism spectrum disorder. This book will help children develop empathy toward their peers with learning differences. What better way to raise awareness of children with autism than through a children’s book? Tara Annette Rocker did just that with “The Adventures of Snook and Gator: Snook Meets a Buddy” (ReadersMagnet; 2018). 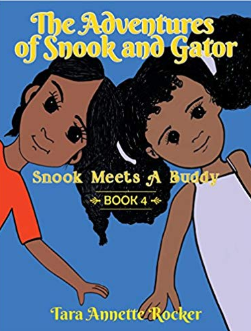 “Snook Meets a Buddy” is the fourth book in a children’s book series that follows the life adventures of Snook, who is 7 years old and in second grade in this installment, and her pet dog, Gator. However, Gator does not figure much in this story. Instead, the attention focuses on Ariah, a quiet girl who is also 7 years old. Ariah comes from another class, which is a special class for autistic children. Snook and Ariah are paired as buddies for an “About Me” project. Together, they learn more about each other, to the point that Snook invites Ariah to play with her at her house. “Snook Meets a Buddy” extols the roles of schools and parents in shaping the children’s attitude toward peers with learning differences. Snook’s teacher, Ms. S, and her mother provide positive influences, which impact upon how Snook acts and behaves toward Ariah. Order today a copy of Tara Annette Rocker’s “The Adventures of Snook and Gator: Snook Meets a Buddy” through Amazon and Barnes & Noble. Await the public display of this eye-opening children’s book at the upcoming Los Angeles Times Festival of Books on April 13-24, 2019 at the University of Southern California in Los Angeles, CA.